Social Justice Fund Northwest is a foundation working at the front lines of social change since 1978. Using our innovative Giving Project model, we leverage the resources of our members to foster long-term social justice solutions throughout Washington, Oregon, Idaho, Montana and Wyoming. 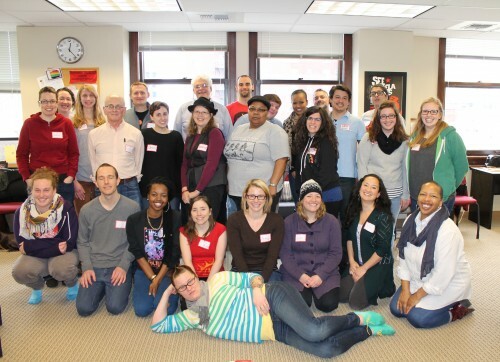 2014 Criminal Justice Giving Project - Coming together to fund social change; This image was taken following an intensive, all-day training session. Central to this process is engaging a diverse community of philanthropists from a variety of class backgrounds. In doing so, we are able to democratize philanthropy and cultivate an environment in which all people can see themselves as part of the solution to community problems. Mainstream philanthropy tends to focus power and influence on the biggest donors, at the exclusion of others. The development of our Giving Project model emerged from a challenging period in our history. We have been funding organizing work since our inception in 1978. For much of that period, our approach was somewhat similar to other community foundations, in that we raised money from our membership and parcelled out those funds based on our programs and priorities at the time. Our members would sit on grantmaking committees to make decisions about how grants should be allocated in the community. In 2008, the US economy crashed. Like so many organizations, we were feeling squeezed by the shift in our member’s resources, and at the same time, we were in the midst of a change in leadership. We soon recognized that in order for our work to be sustainable, we needed to cultivate long-term relationships with more people, and access new networks of social justice leaders. In 2010, we partnered with Resource Generation (a national organization that helps young, wealthy people figure out how to use their resources to support social change) to organize the Next Generation Giving Project, a pilot program that would engage 18 people of all giving levels in community building, fundraising, and grantmaking. Without knowing what was feasible, the cohort set a fundraising goal of $50,000, which they would then grant out to organizations. Over the course of the succeeding 4 months, the group raised over $135,000, shattering everyone’s expectations. A new model was born. We wondered, if 18 people–who are not experienced fundraisers–can raise $135,000, what can 100 or 1,000 achieve? We decided to find out. The next year, we fully shifted our grantmaking process to utilize the Giving Project model. In 2011, we undertook 5 projects; in 2012, we did 7. Last year, we completed 9 Giving Projects. Overall, we have engaged more than 350 leaders through our Giving Projects, raised more than $1.5 million, and made 127 grants to grassroots organizations throughout the Northwest. Have you ever been met with resistance or criticism when using your Giving Project model? We haven’t experienced much external resistance to our model. Initially, there were some concerns raised about whether or not this process would devolve into a popularity contest of sorts–that our members, who don’t necessarily have extensive experience as grantmakers–or even donors–wouldn’t be as effective in this role compared to other philanthropic institutions. What we’ve found however, is that the grantmaking training we facilitate for Giving Project members is extremely effective in preparing them to make sound decisions about how funding should be allocated. It’s a rigorous process, and our staff are adept at guiding participants in a way that grounds their decisions in our shared organizational values, while giving them enough space to make their own determinations. Overall, the type of grantees we fund has remained the same since our founding, and their effectiveness is just as strong as ever. One challenge we faced as we scaled up was participant retention in the Giving Project process. Initially, we weren’t sure how much information participants truly needed before they could realistically commit to a Giving Project. We weren’t even precisely sure what we were asking of participants ourselves–the model was just so new. There was a brief period in which we saw a number of Giving Project members drop out of their projects midway through the schedule. The commitment was simply more intensive than they had anticipated. In response, in 2012 we changed the way we recruited for our Giving Projects. Rather than entering recruitment meetings afraid that the schedule might scare prospective participants off, we initiated conversations with a very clear picture of how intense the commitment would be. Did it scare some people away? Sure. But the ones who stuck around were that much more committed to the project, and our fundraising efforts were more successful as a result. Community-driven philanthropy is critical to our ability to effect long-term, sustainable change. We need to create space for everyone to see themselves as part of the solution to community-wide problems. Injustice and oppression are manifested in all levels of society. It is intrinsic in many parts of our culture. The only way to eradicate root causes of social justice issues is to fundamentally shift how our community addresses these problems. To do so, we need all the perspectives we can get, as well as all the resources we can muster. We need people to drive this process for themselves. This simply doesn’t happen when power is concentrated into the hands of the few. Conventional philanthropic models tend to rely on a smaller number of people to make decisions about how and where to invest in the community. Our model creates the opportunity for all people to access power in determining where need is greatest, and in deciding what solutions are most promising. Work for equity at all levels in your process. Engage a diversity of voices and perspectives, and don’t be afraid to diffuse power. Engage people authentically and build relationships with the long game in mind. On the front end, this sort of approach can take significant investment, and when you innovate, you invariably make mistakes. Both are ok. At the end of the day, it’s important for us all to be intentional about building collective power, because there’s just a whole lot more of it. Innovation is as important in the philanthropic sector as it is in technology and business. We need independent thinkers and experimenters to find new ways of moving resources for social good. It has to be more values-based than social enterprise, and more inventive than mainstream philanthropy. This sector is important because it gives us the opportunity to help people discover their own power to effect change and create an environment in which we are all able to thrive.